Epic battles in the world of the Middle Ages, where you - the lord, master of the castle, and therefore need to develop an empire, to create legions of intrepid warriors and discover new lands. Do you want to try your hand as a skilled ruler, the founder of the empire? 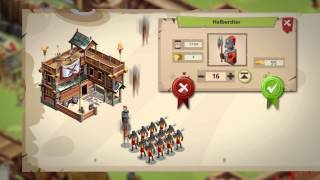 - In this case, we invite you to the game Goodgame Empire: the medieval castle and the powerful army is already waiting for its hero! To start the game online Goodgame Empire you need to go through a simple and quick registration. To do this - click on the button at the bottom of the review, and then you get to the game page. In Goodgame Empire registration of a new user requires you to fill in the fields: 1) e-mail address; 2) the game username and password. The mailbox you want to use actual, because it comes a confirmation email Goodgame Empire registration. If you want to play Goodgame Empire without registration - sign in through your favorite social network button, and join like-minded community. Starting to play Goodgame Empire online you will immediately note the schedule: in addition to bright colors and high-quality drawing elements - players expect to live (moving) the characters that perform the tasks assigned to them. Expansion of the territory - when you implement it - is also displayed in real changes in objects and structures, that is, changing their appearance, and not just the numbers on the screen. Dlya order to pass the level of the game Goodgame Empire - you have to improve the existing structure, create new ones, carry out a number of tasks - quests, which, in turn, will pump your game character - Lord. A job you are waiting for exciting and innovative: public problems and issues of the local population, the city defense from invaders and rescue beauties. Goodgame Empire - online game that will surprise connoisseurs browser strategies qualitative study of the script. Many subplots and surprises (the invasion of refugees, jousting tournaments, and much more), and multi-variant behavior of the player in a collision with these surprises. In general, bored willing to play Goodgame Empire - will not have to. As with other browser-based strategy, the game is available for general map: it shows our castle, and the castles belonging to other gamers. To attack the castle walls are 3, 3 more walls serve to protect. Entering the fight game Goodgame Empire to play should be as follows: select the direction of attack, the number of guns and the military. The tools are divided into offensive (rams, ladders, siege towers) and protective (goats resin, stones, and more), and make them have to fight for the workshop in advance. The only noticeable drawback of the game - automatic blunder after another, in general, depending on the tactical arrangements of troops and equipment, and not only on the number of soldiers. 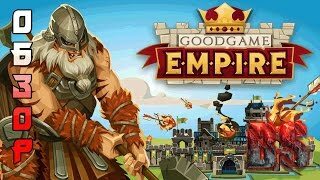 Welcome to Goodgame Empire to play online for free right now by clicking on the button at the bottom of the review.